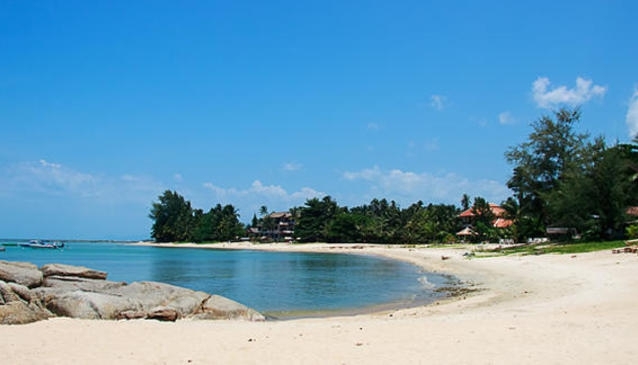 Located on the Samui Ring Road, between Lamai and Hua Thanon is the picturesque beach bay area of Ban Nam Jerd. It's actually closer to the village of Hua Thanon, just after Wat Sila Ngu. This is a great little spot to escape the crowds of Lamai Beach and enjoy a bit of Samui to yourself. small Intermittent boulders break up a soft sand beach with clear, shallow and calm waters, protected from most directional winds. There isn't much in the way of a accommodation, just a few bungalows dotted around the bay. There are some great little beach restaurants and bars to enjoy lunch, dinner or a drink. One of the unique opportunities Ban Nam Jerd offers is pleasing for both those that want to relax and those that would like to partake in some adrenaline fueled water sports action. Ban Nam Jerd is home to Samui's, if not South East Asia's most unique super water sports toy businesses, Water Edge Sports. You might think this is a paid link, but it isn't. We're here to offer you as much information about everything this island has to offer and while mentioning this beach, Water Edge Sports cannot be over-looked. These guys have unique state-of-the-art water sports toys that you will not find anywhere else on this island and they are the ultimate in fun. Fancy hovering 30 metres above the water with a jet pack like James Bond? We need say no more, check out there profile for further information.